Editor's Note: The following was taken from the 4x4Wire Trailtalk Forums. Air shocks have long been discussed as an improvement for the independent front suspension (IFS) on Toyotas. In theory, the air shocks would take advantage of Newton's Third Law: Every action has an equal and opposite reaction; in this case to better distribute forces between the two wheels. I went through a few sets of shocks including Rancho RS9000s, Trailmaster Invaders, and Gabriel Gas Ryders. I prefer the air shocks to all of them, in fact I would say that this is the best modification that I have done other than a locker. The shock body with the air line in the foreground. The new angled bumpstop spacer. 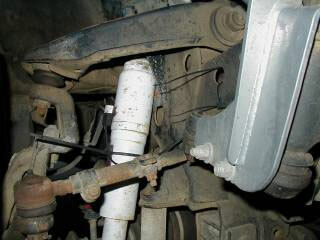 I am using Gabriel HiJacker 729279 Air Shocks on my 1989 4Runner with a 4 inch suspension lift. Similar shocks could be used on a stock height vehicle, but they would require a different length shock with a different part number. The suspension lift is recommended with this modification though, as it creates extra room to really take advantage of the additional travel offered by the air shocks. 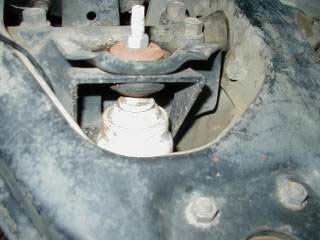 For the best results, some fabrication and relocation of the stock compression bump stops is necessary. Given the high stock spring rates even with a large travel window you get maybe 6 inches of wheel travel before you lift a wheel. The alternative is to get a solid axle and flex like mad. There isn't a whole lot in between and what's there is kinda pricey. Certainly there is no substitute for the articulation and durability offered with a solid front axle, but for those not looking to commit a lot of money or fabrication to your truck, air shocks are a great alternative. The shocks cost approximately $40, a travel kit is another $40 to purchase, or much less if you make your own. The shock brackets only require a few dollars worth of steel. The entire front suspension bracketry. As for how it works. The air shocks share the same volume of air. 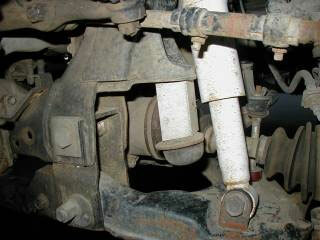 That air is under pressure of course which takes load off of the torsion bars. Now, the shocks don't care if one is compressed and the other is extended or both are even, it's about that given volume and the resulting pressure. Where you lose the force required for traction is when one spring is bearing the majority of the weight. There is only a fixed amount of weight, what you take from one you give to the other wheel. By placing the load on the air shocks, which remember don't differentiate force based on their compression and extension, you help to remove the springs from the equation. The more you load the shock, the less you load the spring. Less loaded springs flex more for a given amount of load. Think of it like this, you take a spring at rest, push on it, it flexes. Now preload the spring and push on it again, it's much harder to flex. The shocks lessen the preload. 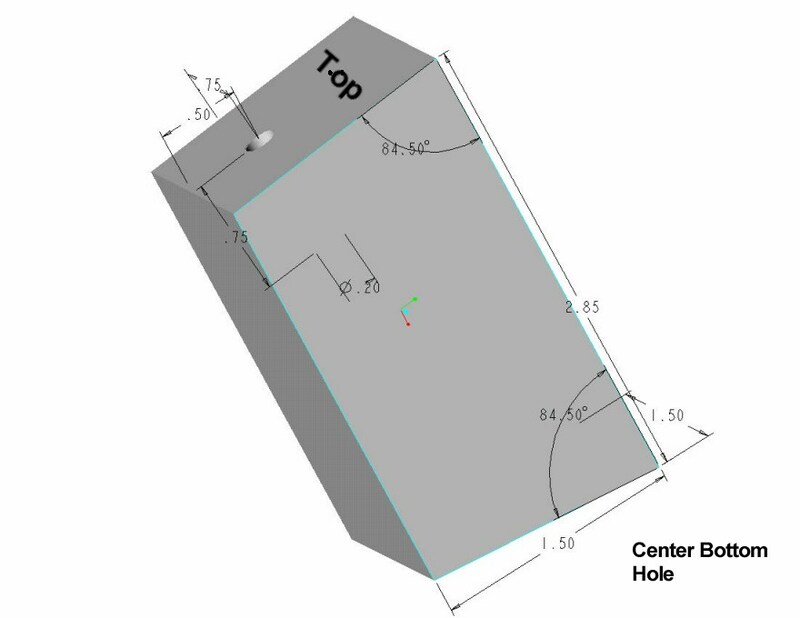 Dimensions of the aluminum bumpstop spacer. The stock shock mounts are not very strong. In fact, when I first aired up the shocks, the stock mounts flexed quite a bit. To remedy this, I made some re-inforcing brackets. Thus far they have withstood high speed whoops and slow speed crawling flawlessly. The lower shock mounts were not modified, as the loads they see are mostly in compression. At extremes, there is a shear component as well. Whether or not this ever becomes a point of failure remains to be seen, but I can say that I pound my truck really hard and have had no problems. I also made some blocks out of 1.5" square aluminum stock to expand the travel. The spacers are 2.85" long and are angled at 11 degrees for square contact. A section of dowel also needs to be added to resize the lower eye to the size of the bolt. I started out running the shocks at 85 psi had approximately a 30% improvement in suspension travel and ride quality. I then increased the shock pressure to 110-120 psi and loosened the torsion bars by 18 turns. Though this is far looser than stock, there is still plenty of bolt available above the cam. I never got to quantify this increase but from just seat of the pants wheeling, it is like night and day from the previous setup with traditional shocks. Instead of the truck pitching and tossing like it used to, it actually articulates over the terrain. It is like riding on air. It uses all 12" of available wheel travel. The truck actually feels like the front end is pulling for a change. Like any suspension modification, there are adverse affects that accompany the gain in travel. The first is that when you cross link the shocks, the vehicle behaves more "top heavy". This is a much bigger concern on-road as it can lead to excessive body roll. Off-road, the only problem I see is in off camber situations. The downhill shock will compress, pushing the air into the up-hill shock. For a vehicle driven on the street, it would be wise to add a sway bar along with the air shocks (if the vehicle is not already so equipped). 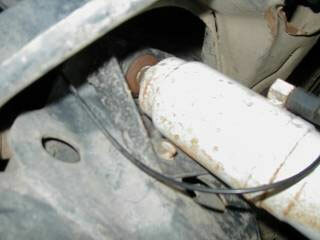 The second point is that the more air you run, the more the preload of the shocks overcomes their dampening ability. These two drawbacks, however, are not enough to outweigh the significant gains in suspension travel. As for lean, since the springs are not wound as tightly, a given transfer of load will yield more flex and more lean. It should be noted however, the exact same thing would happen if you put in a softer spring. If you want flex, you either need soft springs (solid axle or not), or use a system like this to remove stiff springs from the equation enough to allow some travel.